Bohnanza, the classic bean-trading card game by Uwe Rosenberg who later would design Agricola, has had almost 30 expansions and spin-offs published in Germany since its debut in 1997. A relative few have made the voyage across the ocean to the United States. One of the newest immigrants, La Isla Bohnita, comes bundled with a partner in Rio Grande Games’ Bohnanza: Princes & Pirates. Bohnanza: Pirates, aka La Isla Bohnita, brings merchant ships and pirates to the mix, providing more ways for you to acquire beans, as well as pillage them from your fellow bean traders. Each player set includes: a Home Port, two Merchant sets and a Pirate Ship. Players each begin play with a Home Port and a Merchant Ship. Each player begins the game with a Home Port, a Merchant Ship, and two Bean Fields. You can buy a second Merchant Ship, a Third Bean Field and/or a Pirate Ship later if you wish. Place La Isla Bohnita in the center of the table. Note that the island has two ports: Bohnbay and Bohnaco. Deal 5 cards face up in a row next to each harbor with each new card overlapping the previous. The beans in La Isla Bohnita’s ports are harvested beans, sitting on the loading dock, awaiting shipment (via a merchant ship). Deal 3 cards to the start player, 4 to the second player, 5 to the third player and 6 to everyone else. When playing a two-player game, both players receive 5 cards. Play follows the usual Bohnanza phases – 1) Plant, 2) Trade, 3) Draw – with ship movement and pirate raids added to the Trading phase. Note that now the Trade Beans and Planted Traded Beans have been combined into a single phase. I’m going to focus on the differences in play here. I’ve provided a full run-through of Bohnanza’s game play in another article. Phase 1: Plant Beans has not changed. You must plant the first bean in your hand and may, optionally, plant the second. You may never plant beans on a ship. Only harvested beans can be loaded on a ship. The ships provide an intermediate accumulation point for harvested beans before sale. Phase 2: Trading starts in the usual way: by turning up 2 cards. Thereafter, you may trade, harvest beans and move your ships in any order you wish. Let’s talk about ship movement. La Isla Bohnita. During setup, deal 5 cards face up & overlapping in a row next to each harbor. These represent harvested beans, sitting on a loading dock, that you can acquire from the island’s ports. You may move one of your empty or loaded merchant ships from your home port to one of La Isla Bohnita’s ports. 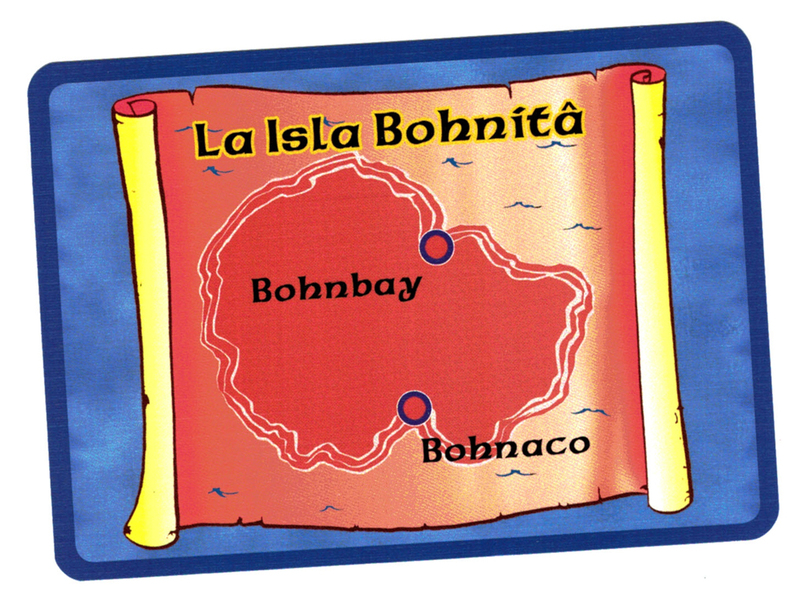 From La Isla Bohnita, you may move to the other island port or back home. Just announce a port destination for one of your merchant ships, then load the topmost bean from that port onto your ship. You may load more of the same type of bean if they’re the next beans up. Each merchant ship may only carry one type of bean, though. If you have a pirate ship – costs 2 coins – you may attack your fellow traders’ merchant ships in their home ports once each. The attacked player may immediately sell their merchant ship’s entire bean cargo and deny you your booty or give up 1 bean to you. Your pirate ship, however, may only carry one type of bean. At any time during the Trading Phase, you may plant beans in your fields that you drew to start the trading phase or acquired via trades with other players. Thus, with this expansion, there is no definite demarcation between Phase 2 Trading Beans and Phase 3 Planting Traded Beans as there is in Bohnanza and Ladybohn. You can also freely harvest fields and sell the beans immediately or load them on to merchant ships for later sale at any time. You can likewise sell the bean cargo loaded on your merchant and pirate ships at any time, but with one caveat: you must make a profit. That is, you can’t just dump beans in the ocean whenever you want, you have to sell them for at least 1 gold coin. If they’re not worth a coin, you have to hold on to the cargo until you’ve accumulated enough beans of that type to make a buck. It costs money to run a ship and pay its crew. You don’t want to incite a mutiny. A couple more things you need to know about ships: You can never transfer beans from any ship to a field. Remember, beans on ships are harvested beans, not seeds you can plant. Neither can you transfer beans from your merchant ships to your pirate ship. Your pirate ship can only steal beans from other traders’ merchant ships. Beans from your hand, or acquired in trade from other players, can only be planted in fields, never loaded directly onto ships. Beans have to be planted in a field, before they can be either 1) harvested and sold immediately or 2) harvested and loaded onto a ship then sold. Only harvested beans can be loaded onto ships. You can, however, transfer beans from your pirate ship to your merchant ships and between your two merchant ships at any time, regardless of whether they’re worth any gold coins or not. 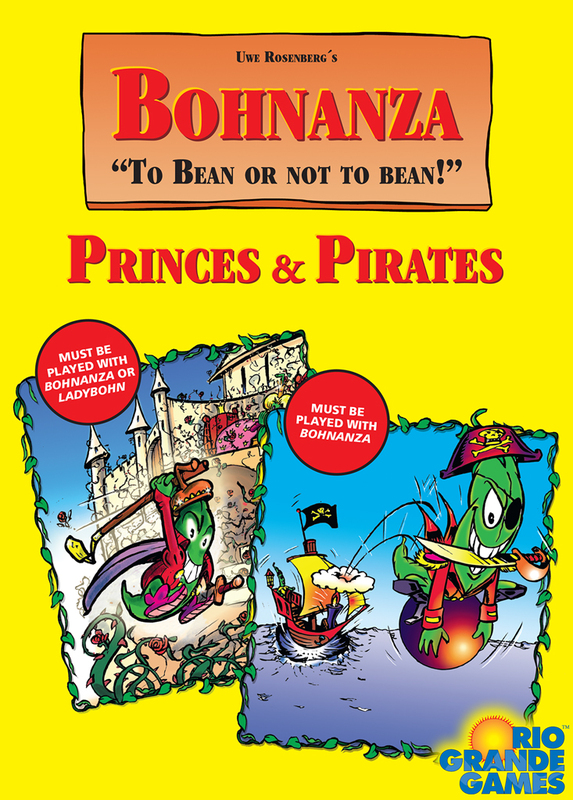 Bohnanza: Pirates includes seven 3rd bean fields. Players can buy a third bean field at any time for 3 coins or a pirate ship for 2 coins. A second merchant ships costs 5 coins in a two-player game, 4 coins in a three- to four-player game and 3 coins in a five- to seven-player game. Two new beans: Pole Beans and Mocha Beans. 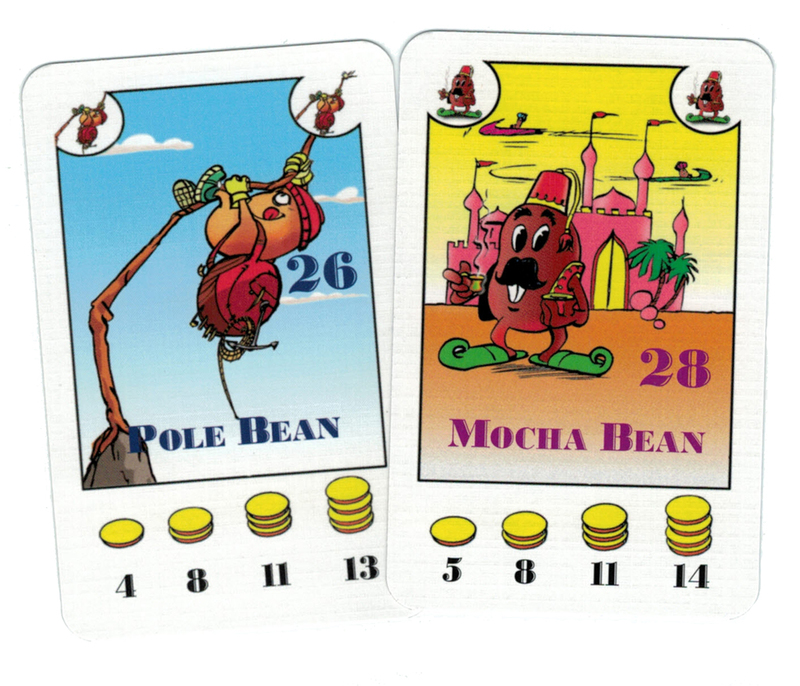 Bohnanza: Pirates also adds two new beans to the bunch: Pole Beans and Mocha Beans. There are 26 of the former and 28 of the latter. These provide some additional long bean options, so players can compete with each other in more bean markets than just Blue Beans, Wax Beans and Coffee Beans. As in the base Bohnanza game, before setup you’ll have to remove some types of beans from the deck according to the number of players. The publisher helpfully provided a table with the details on the front of the Bohnanza: Pirates rulebook. The game continues until you’ve exhausted the deck three times, same as in the base game. 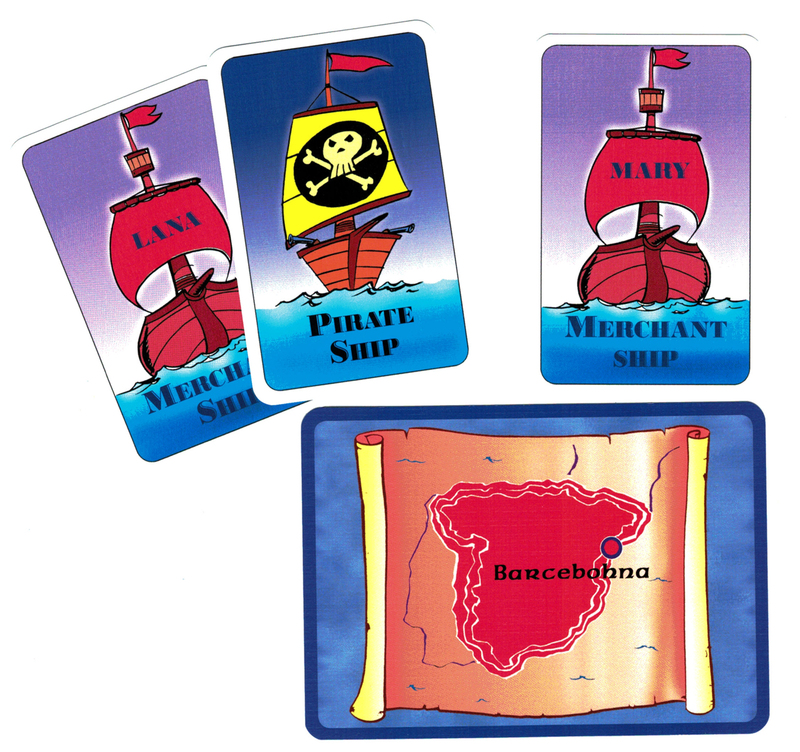 Bohnanza: Pirates is one of two expansions included in Bohnanza: Princes & Pirates. It supports 2 to 7 players, ages 13 and up. Play time is about 1 hour. While Bohnanza: Pirates adds some complexity to the game, it’s not overwhelming. So, younger players should be able to handle it fine. I would recommend teaching the base game to most players before trying to add the expansion, though.